Alison Evans breaks new ground: as an author and in the creation of the characters who inhabit this gripping book. Alison identifies as genderqueer – she doesn’t identify as male or female and eschews the female and male third person personal pronouns, using ‘they’ instead. One of the characters in Ida’s world, Daisy, reflects this. The reader of Ida has two unfamiliar ideas to grapple with: the existence of parallel universes, with the main character able to move between them at will; and the use of ‘they’ in relation to Ida’s singular ‘bestie’/partner, Daisy. It is truly a mind-stretching work. By way of an aside but not irrelevant to this novel, attitudes in societies change over time, including those to do with relationships and individual autonomy. In my lifetime there have been massive changes in the way women are perceived by their society – from expectations that they would marry and raise a family to a much greater degree of individuality and agency. I do, however, acknowledge that there is a long way to go. More recently, there has been growing acceptance of non-heterosexual relationships, along with the changes that are needed in our language to reflect those changes. A growing awareness of gender fluidity is replacing the hard-and-fast notion that there are only two genders. Some time ago, women were generally addressed and referred to as ‘Mrs’ or ‘Miss’, depending on their marital status. The honorific ‘Ms’ was eventually adopted to address women, to theoretically put them on a par with men (who were always ‘Mr’) to make marital status irrelevant. Genderqueer people need personal pronouns that don’t automatically attach a polar gender to them and which are not clumsy, as the current ‘they’ is to denote a single person. Eventually we may settle for a new set of pronouns that move completely away from any gender connection and will be used for all people. This will reflect society’s shift towards accepting every person as an individual human being without tags to define them in the eyes of others. By the way, ‘queer’ in the sense of ‘genderqueer’ does not mean ‘strange’, but ‘across’ or ‘crossing’, as in the German word for transverse flute: querflöte. Enough of my lecture – back to the book. Alison is masterful in the way they draw the reader in, having us wonder what is going on. Then, when we know, we start worrying about Ida – is she going to be able to survive this ability to repeatedly switch to an alternate universe where what just happened here, hasn’t happened? In the process her alternate selves start to be a problem for her. 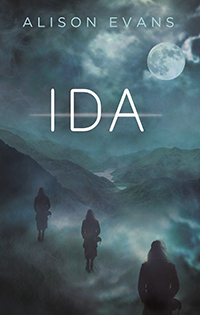 What also increasingly becomes a problem for Ida is that not all the people who are important to her exist in every alternate universe she transfers to. She especially misses Daisy when they are absent from some of her worlds. There are bittersweet scenes when Ida comes across people, dear to her, who have already died in her ‘real’ world. She learns that there are advantages and disadvantages of having such loved ones in her life again – there are trade-offs. The question that keeps bubbling under the surface is, “What if?” And Ida gradually learns some of the answers to this question. Alison Evans is clever in the way they bring in two other characters who are hard to define – they are somehow involved in helping those people who move between parallel universes. We, as readers, cannot place these two into neat pigeonholes in the same way we cannot pigeonhole genderqueer people, whether an author or a character. If we can accept the characters Damaris and Adrastos as simply being who they are, we can accept the character Daisy and the author Alison as being who they are. Alison deftly moves the novel along, heightening the tension and upping the stakes page by page, with the resolution finally coming in the last two pages. I found this a very rewarding novel, partly because it challenged me and largely because it is so well written. Ida does what a good novel should.